when I was little I had a raggedy ann doll, according to my mom I carried it everywhere. in 1956 I lost my raggedy somewhere between philadephia to san diego. I was flying to san diego with my nana and "dodo" after having spent the summer with them while my mom, dad and brother moved from florida to california. my folks wisely thought it easier to get settled into our new home without an active toddler underfoot. my grandparents didn't exactly know where raggedy went missing - the plane stopped a couple times before arriving in san diego. when I discovered raggedy was gone, my mother said I was quite inconsolable. some weeks later, a package arrived at our home. inside the package was raggedy. I was ecstatic and I resumed my practice of carrying raggedy every where I went. she never divulged where she went or what she did; and it is a mystery as to how raggedy made her way to her new home and to me. all my mom can remember is that one day a package arrived from st. louis addressed simply to "the little girl" with our address on la dorna drive. inside was raggedy. no note and no explanation as to how she found me. as I got older I eventually quit carrying raggedy everywhere. however, by then she became a very ragged raggedy - the fabric of her face was soiled to a permanent deep tan, one eye had fallen out and her original dress had long gone missing; but, I loved her as every child loves his or her oldest childhood friend. as a 'navy brat' my family moved frequently and raggedy happily moved from one home and one place to another. over time raggedy simply became a decoration on my childhood bed. when I left home for college I did not take raggedy with me. one year I came home; my room was redecorated and 'repurposed' and raggedy was gone. I like to think that maybe raggedy felt as I was off starting a new life, so would she start a new life and she picked up and resumed the journey she abandoned oh so many years before -- with my raggedy this is a strong possibility. it's funny, I will on occasion think of raggedy. 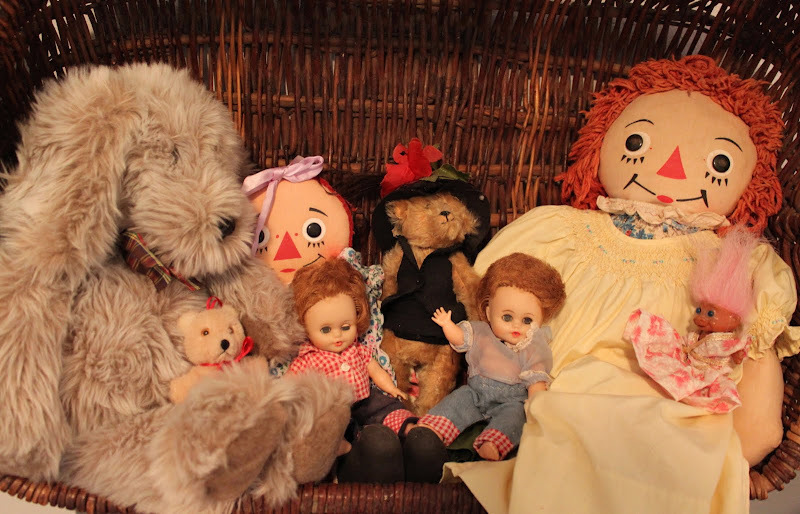 when I see an old raggedy ann a wave of nostalgia hits and I wonder what my raggedy is up to these days. Hmmmmm... Nope, dolls are completely out of my personal experience. I didn't even play with GI Joe as a kid. Now, model airplanes are a whole 'nother story! I had Raggedy Anne and Andy, and several other dolls. Over the years, they made their way into other children's hands since my mother was a teacher and could always find a child in need of toys or clothing I no longer used. It made me happy knowing they went to other kids rather than a bin. I must admit I had a Raggedy Ann with one arm when I was little and I still have her. I have no idea where she came from but I had a soft spot for her. When I moved to NY and was going to NYU I went out one night and was walking home very late. I was in alphabet city which was not the best part of town. A homeless woman stood in front of me very quietly and looked directly into my eyes without saying a word. She lifted up Raggedy Ann's dress and pointed to her heart. I gave her all my money. This was so long ago but that experience stuck with me all these years. It was so powerful to me. Anyway, I have put a link to your blog at the bottom of my ABC post. I find it amazing that your doll was sent back to you. That was one very thoughtful person with a big heart. Beautiful post mouse. It was a stuffed Lion for me...he had a hero's funeral pyre as he went up in the Berkeley Hills Fire some years back.